Made of spices, whole fruits, and zinfandel or merlot, these sauces let you drizzle wine on anything. Drinks or dessert? You can have both... for breakfast (or whenever you're feeling saucy). These small-batch sauces don't contain alcohol, but add a subtle, fruity wine flavor to everything from your morning yogurt to your after-dinner cheesecake. 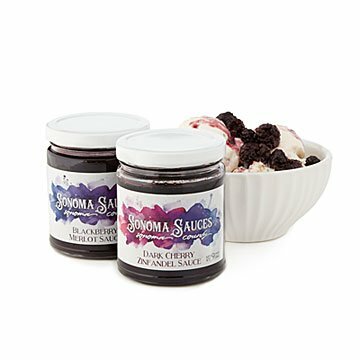 Made with spices, whole fruits, and Sonoma Country wines, they're a tasty way to add zinfandel (and dark cherry) or merlot (and blackberry) to your favorite foods. Made in California. I love putting it in my drink while I am preparing dinner with it! So yummy in stuffed french toast. A must have in your pantry!